As is custom at the end of each year, here's a photo collage of all the projects completed in 2010. I had actually completed 45 projects, but a lot of them were project bags that had gone onto their new homes before I had the chance to take any photos. Some were repeated project bags - meaning that I liked a project bag so much that I made another exactly like it, with the random exception of a different zipper colour. The very first completed project of the year was an aqua skull and knitting needles project bag lined in black that I had made for the Bitchy Bees' Christmas party. That bag was my first venture into sewing project bags. I'm very sad that I never got to take photos of it before it was swapped around in the Bees' annual gift exchange. When I look at that mosaic I feel like I haven't really been productive all year, but when I think about it I had knit 14 completed projects (and there were a lot that I had started and worked on a great deal but couldn't finish before the year was over) and I am by no means a fast knitter. I should also be proud that considering that I rarely had any time to sew and was using the time when the Munchkin was down for a nap as sewing time, I had actually sewn up quite a bit. 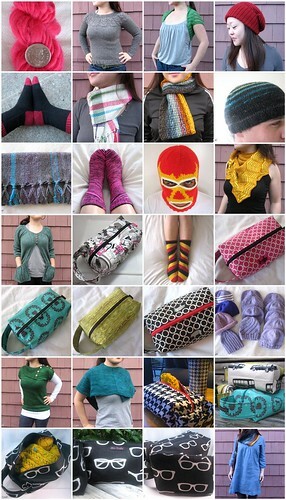 I was hoping to participate in the 12 in 2011 movement - for those who are not a part of Ravelry, the 12 in 2011 is basically pledging and planning on making 12 projects before the year is over. You pick the projects and then gather all materials needed for each project so that there is nothing to hold you back from completing it. The whole point is to finally get those patterns in your queue made, yarns from the stash used, and getting that feeling that you've finally made a dent in (hopefully) both areas. Unfortunately my hands are still not feeling 100% and I don't want to risk permanent damage by being stubborn and knitting more than I should (anyone know of some good stretches for the hands and arms?). So I don't think the 12 in 2011 is going to be a realistic option for me. But that's ok. I'm hoping to sew more this year and one of my 101 goals is to read 50 books anyways and so far I only have 7 books under my belt. Maybe 2011 will be the year of the book?